Organize an easy-to-follow presentation to make a huge impact. Ready Index® Translucent Table of Contents Dividers will help you organize an attention-grabbing presentation that will really engage your audience. They include a pre-printed and numbered Table of Contents page and 10 pre-printed, numbered multicoloured divider tabs to help easily sort important documents. Organize an easy-to-follow presentation to make a huge impact. 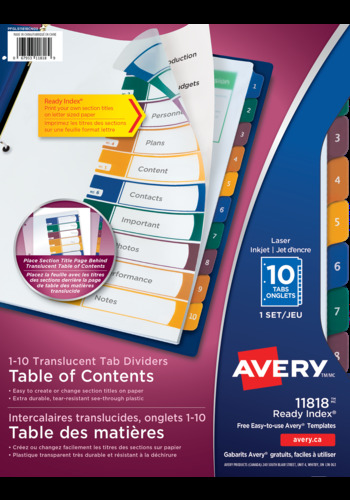 Ready Index® Translucent Table of Contents Dividers will help you organize an attention-grabbing presentation that will really engage your audience. They include a pre-printed and numbered Table of Contents page and 10 pre-printed, numbered multicoloured divider tabs to help easily sort important documents. The contemporary-looking, translucent plastic pages creates an attractive look and provide extra durability to stand up to wear and tear in binders. You can customize the table of contents page using the Avery® Design & Print Online Software, to add section titles, graphics, or your company logo, then print with your laser or inkjet printer in no time. Use in either portrait or landscape formats to suit your presentation. Ready Index Dividers feature stronger tab reinforcements and double-sided hole reinforcements to prevent tearing. Impress clients with an impressive and professional presentation.